Very responsive to our initial inability to activate the wifi. Thanks, Hillary for all your help. We really appreciated it! Delightful property however is was further than we thought from the mall. Over 1 mile. Garden view very pretty from the lovely deck. Ease of parking a bonus. Layout lovely and very nicely appointed. well designed guest house, perfect for a couple, and location was great. Very polite and efficient and professional. Beautiful view out of large windows. Very spacious and comfortable. Everyone on your team was wonderful! It was a great house to prepare for our daughter's wedding at UVA. It was very comfortable, but also very unique. We had a great time! Great location. Tons of space. I was extremely impressed with the professionalism of the management staff. They were enthusiastic and knowledgeable about the properties and area. The reservation process was easy to use. The automated emails provided the necessary details to understand the payment schedule along with the rules and regulations while renting the property. 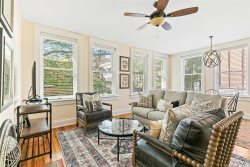 The property is located conveniently, approximately a 25 minute brisk walk to the downtown mall. As mentioned earlier, the deck, exterior lighting, yard/adjoining gardens are beautiful, making it an enjoyable experience just sitting outside particularly in the evening. The sliding doors and atrium type windows supply loads of natural light during the day and beautiful views of the lighted trees and shrubs at night. The steam shower was a real treat after many hours of walking around Monticello, the many wineries, and the downtown mall. Hillary is always super helpful. And remembers us when we call. I love staying in these apartments for work. I live in VB and have an office on Water Street. So to stay right there close to the office around all of the restaurants makes me working away from home very convenient. I like 306 the best. Then 202, then 201. 201 seems to be a little noisier. Hillary has been extremely helpful. We love the design of the apartment. The beds are very comfortable the linens are beautiful, the art is tasteful. It is an easy walk to everything you need. Too bad about the noise level. Team was very responsive. House was exactly as depicted online. We enjoyed our stay. Wished we had a bit more time to enjoy the deck. The little interaction I had with the staff was excellent. They were easy to reach and questions were answered quickly and professionally. Excellent overall location, close to downtown and walkable to nearby restaurants. Good views of the mountains for an in-town location. Some road noise inside from Route 20, but given it's excellent location in town this was easily overlooked. I would not hesitate to rent this unit again. The team was very helpful with any questions I had. Thanks Tina. Great location! Close to UVA, a large shopping center (with two grocery stores) and located to easy access to routes to historical sites. Very clean and comfortable. Highly recommend it. Clear instructions, friendly yet business-like communications. The property completely blew us away. It was beautiful, spacious, well-stocked, and had a brand-new quality. Walking to the pedestrian mall was a pleasant and easy (20 min. )stroll.